Thank you for taking an interest in St Francis of Assisi as a place of excellence in education. The choice of school for your child is an important step for your family. The decision you make impacts on the development of your child as a whole person, physically, emotionally, intellectually and spiritually. We welcome you to come and meet with our Principal for a guided tour with our school. For enrolment enquiries, please call (02) 6292 4500. Our 2019 Open Days will be held on Monday 6 May and Wednesday 29 May and you are welcome to come along from 9.30-11.00am and 4.00-6.00pm to have a look around our school. Enrolments for places at St Francis of Assisi in 2020 close on 31 May 2019. 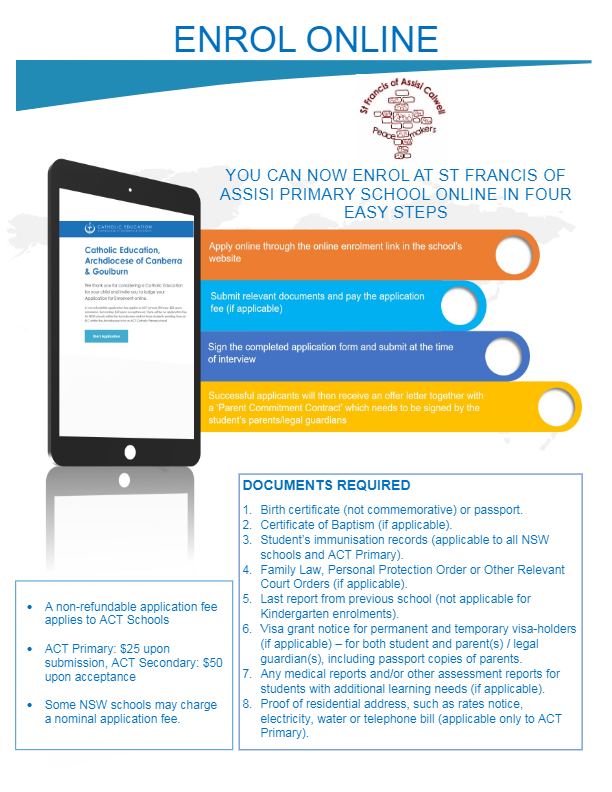 You can now enrol online at St Francis of Assisi by selecting the link above. Alternatively, submit the following paperwork and enrolment form directly to the school office. To complete the application form you will need to submit the following information. Original documents will need to be presented at the time of interview. Please see below the school fees for St Francis of Assisi Primary School for 2019. Fees may be paid by Cash, Cheque, Credit Card, Bpay, Direct Debit or QKR. Please contact the school office with any fee related queries.